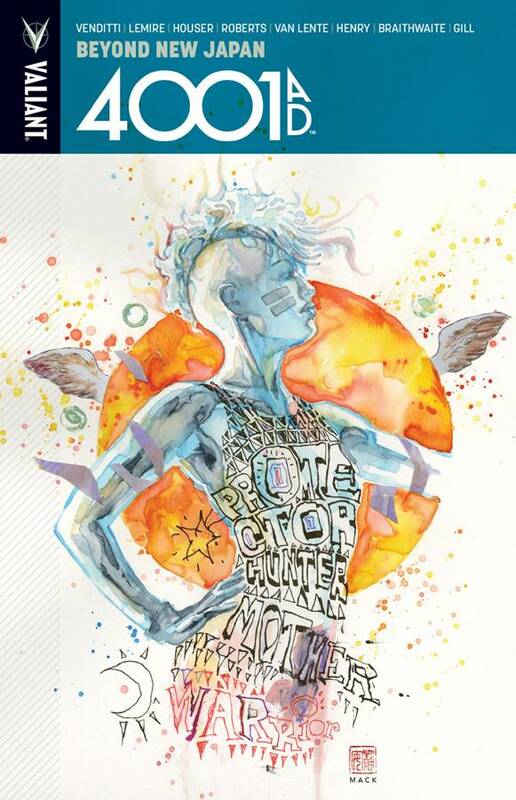 (W) Jody Houser & Various (A) Doug Braithwaite & Various (CA) David Mack. The most ambitious comics event of 2016 brings war to the 41st century - with Rai leading the charge! Rocketing out of the pages of 4001 A.D...the present and future of Valiant's greatest heroes come together in four essential standalone chapters at the heart of the blockbuster comics event of the year! Blast two thousand years into the future as the never-before-told history of New Japan's dominion over Earth and the future fates of X-O Manowar, Bloodshot and Shadowman stand revealed. Then, witness the battle- scarred debut of the boldest new hero of this century or the next when War Mother makes her history-shattering debut! The future starts now as all-star writers Robert Venditti, Jeff Lemire, Jody Houser, Rafer Roberts, and Fred Van Lente join visionary artists Clayton Henry, Doug Braithwaite, Robert Gill, and Tomas Giorello to bring the Valiant Universe barreling into the 41st century! New York Times best-selling writer Matt Kindt (DIVINITY II) and superstar artist Clayton Crain (X-Force) bring their startling vision of the year 4001 A.D. to new heights...with the fate of New Japan floating in the balance! Collecting 4001 A.D.: X-O MANOWAR #1, 4001 A.D.: BLOODSHOT #1, 4001 A.D.: SHADOWMAN #1, 4001 A.D.: WAR MOTHER #1. .